When giving chores or responsibilities around the house, be sure they are reasonable, limited in number, and developmentally appropriate for your child. Check out these tips to stay on task! Write down and post all chores/responsibilities in a highly visible place. Help your child avoid being distracted by the TV by turning it off. Use sticky notes to place on mirrors, doors, and other visible places for reminders. Be available when your child is doing homework to help as needed, but don’t get in the habit of having him rely on you. However tempting it may be, don’t do the work for your child. Ask to see how your child is recording assignments. Praise all efforts at being organized. Expect your child to have all assignments recorded. If he tends to have difficulty keeping up with assignments, turning work in on time, and following through with projects and daily homework, see the teacher! Let the teacher know that this is an area of weakness for your child, and that you want to be in a position to help. Request the teacher’s help in making sure all assignments are recorded daily. Then be sure to follow through by reviewing the recorded assignments with your child. Encourage your child to stay at school until she checks her assignment sheet/calendar. Make sure she has any necessary books and materials needed to do the homework. Have your child take the phone numbers of a few responsible students that he can call if there is a question about schoolwork. Ask the teacher to assign a responsible buddy for this purpose. Some accommodating teachers are willing to share their own home phone number. Ask for progress notes that keep you aware of how your child is doing. If you haven’t received any communication or feedback for a while, call the teacher or write a note. Help child divide the workload and assignments into manageable chunks. Ask to see what she has accomplished after a certain amount of time, or to show you when a particular assignment is done. Important: Your assistance with time management and structuring of long-term school projects (i.e., book reports, science projects, research projects) will be critical to your child’s success. Teach your child how to tell time and read a non-digital clock. Teach your child how to read calendars and schedules. Assist your child with prioritization of activities and workload. Give your child advance notice whenever possible. Pay close attention to due dates. Post the project requirements. With your child, record on a master calendar the due date of the final project and plan when to do the steps along the way (i.e., going to the library, getting resources and materials). Ask the teacher for feedback. Don’t assume your child is working on projects at school, even if he is given some time in class to do it. Avoid procrastination and last-minute scrambling to complete projects. Teach your child to use “things to do” lists (writing down and then crossing out accomplished tasks). Help your child to plan a “things to do” list when he comes home from school — scheduling for the evening, and estimating together how long each assignment/activity should take. Help with preparing and following schedules. Set a schedule for homework. Some children like to come home and immediately get part or all of their homework done and out of the way. Others need a break before tackling any homework. 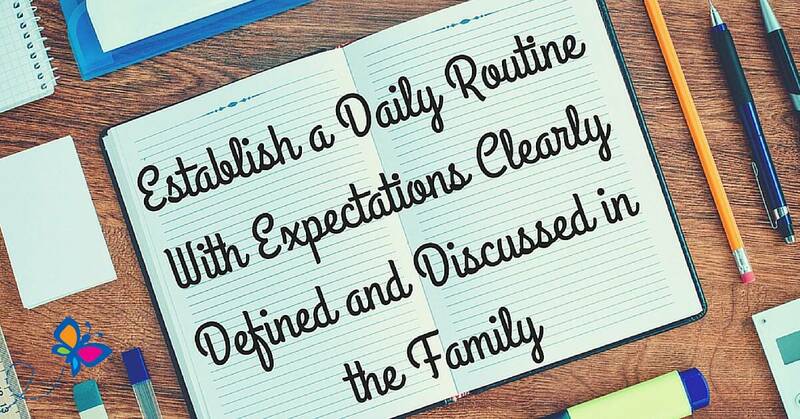 Working together, plan a schedule or time for homework that your child can follow as consistently as possible. Help transfer important extracurricular activities/scheduling onto your child’s personal calendar/planner. Get your child a watch to wear and an accurate clock for her room. A watch that has an alarm set is very helpful, especially if she takes medication and needs to go to the nurse’s office during school. Consider “no phone call” times in the evening. Provide all necessary supplies for school and homework. Label your child’s materials and possessions with her name. With your child, choose a place in the home that has adequate lighting, is comfortable for working, and is as free from distractions as possible. With your child, carefully examine his work space. Make sure your child has a large, working surface (desktop) free from clutter. If your child has a computer, don’t place it on his desk, which cuts down considerably on his working surface area. Instead, place the computer on a separate desk or table. Have your child clear out desk drawers and shelves of work, projects, and papers that were from different school years. Together, decide on what you would like to keep and store out of the way (in colored boxes, or zipper portfolios) in order to make room for current papers and projects. Provide your child with a corkboard and pins to hang up important papers. Hang dry erase boards and markers in the kitchen and your child’s room for important notes and messages. Provide a file with color-coded folders in which your child can keep papers stored categorically. Keep trays and bins for storing supplies/materials in order to remove some of the clutter from the desktop. Keep a three-hole punch and electric pencil sharpener easily accessible. Besides a master calendar (in kitchen), provide your child with a desk calendar that serves as an overview of important dates, activities, and events. Assist your child with cleaning and organizing by getting her started. Make the time to help your child clean and organize his backpack, notebook, desk, and room. Encourage and help your child get in the habit of putting all books, notebooks, signed notes, and other necessary materials inside the backpack before bedtime. Place them in the same spot every night.